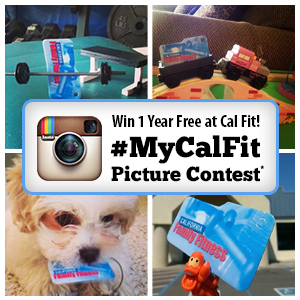 It’s that time of year to flash your membership card on Instagram for a chance to win a 1 year membership with Cal Fit! Now through March 18th, snap a fun and creative photo of your Cal Fit member card, share it on Instagram using the #MyCalFit hashtag and you could win a 1 year membership! Your challenge: Our Facebook fans vote on the best picture, so you need to capture the attention of the voters. So get creative when you snap your photo of your membership card. There’s just one rule, your pictures can’t be taken inside any of our locations! Don’t forget to make your profile public so we can view your photo. Have fun and stand out from the crowd with witty backgrounds and creative poses. On March 23rd, Cal Fit will choose our top 25 finalists based on creativity and if you’ve followed the rules! Then we’ll open up the voting March 23rd - 29th on Facebook for your peers to choose their favorite photo. Your image must be your own original image, created and shot by and/or featuring you; must not have been previously published, released or distributed in any form; must not have been entered into any other drawing or competition nor won any award; and must not infringe the copyright, trademark, privacy, publicity, or other personal or proprietary rights of any person or entity. Modification of an existing image does not count as original for purposes of this Contest.